We are the professionals that have met the consultants demands for a better product. It is an unbelievable sixty years since the writer, Harold Harris and Tony Slota started Mason Industries with Pat Lama joining ten years later. Unfortunately, both Harold and Tony are gone and Pat retired. So at the young age of ninety-three, I continue to run the company with Doug Valerio’s help. Sixty years of continuity and ownership. We offer our thanks to every consultant, contractor and manufacturer who form our customer base. We believe they favor us because of the practicality of our designs and lower installed cost when product works the first time. We stand behind what we sell as no other competitor does. We thank our whole representative organization for their hard work, professionalism, integrity and loyalty. We look forward to serving you. Vibration isolation technology has moved on to the isolation of entire buildings rather than just building components. 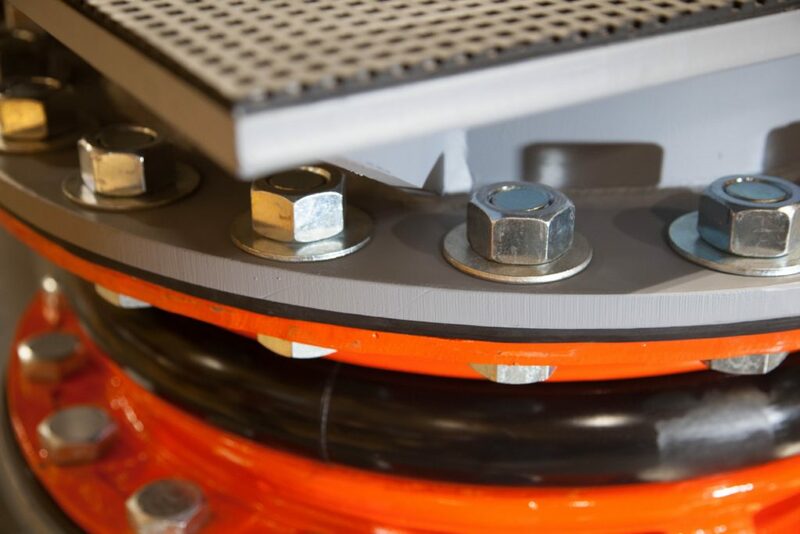 We have designed and manufactured Neoprene and Natural Rubber bearing pads to frequencies as low as 6 Hz and steel spring assemblies in the 0.75 to 2.00 inch (19 to 50mm) deflection range in individual capacities of 1,000,000 lbs. (454,000 kgs.) Both techniques are used to keep ground vibration and noise out of buildings close to railroads, subways, heavy traffic or industrial impact. Rubber bearings conform to Government codes and testing. Life expectancy is 50 or more years. While they are generally not replaceable, replacement can be built into the installation at a small added cost if the locations remain accessible. Spring mountings are often partially precompressed and automatically released as building weight is added during construction. We prefer the technique of structural spring support with removable spacers after the mountings have been hydraulically compressed to assume the building weight. Our professional engineering staff is licensed in 50 states, Washington DC, Puerto Rico, New Zealand and ready to help you.